A survey of populations of invasive Amelanchier spicata and A. alnifolia species has been carried out in the European part of Russia. Along with typical morphotypes, some hardly identified variants with intermediate traits have been revealed. 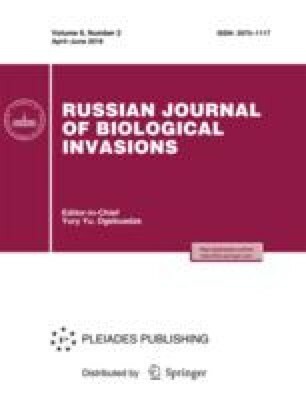 Molecular genetic analysis of ITS1-2 nuclear regions has revealed an intragenomic polymorphism probably indicating a hybridogenic origin of A. spicata. Genealogic relations between ITS1-2 haplotypes of the invasive A. spicata species have been traced, resulting in the conclusion that its formation was connected with hybridization between A. humilis and A. alnifolia; a hypothetical area of origin of its initial forms in North America has been established. Original Russian Text © A.G. Kuklina, O.I. Kuznetsova, I.A. Schanzer, 2018, published in Rossiiskii Zhurnal Biologicheskikh Invazii, 2018, No. 1, pp. 51–61. National Center for Biotechnology Information (Databases). http://www.ncbi.nlm.nih.gov/. Accessed June 22, 2015.